Bake 37 to 47 minutes or until top is dark golden brown and cracks feel very dry and are not sticky. Do not under bake. Immediately turn pan upside down onto glass bottle until cake is completely cool, about 2 hours. In medium bowl, beat whipping cream on high speed until stiff peaks form. Fold strawberry glaze into whipped cream. On serving plate, place cake with browned side down. 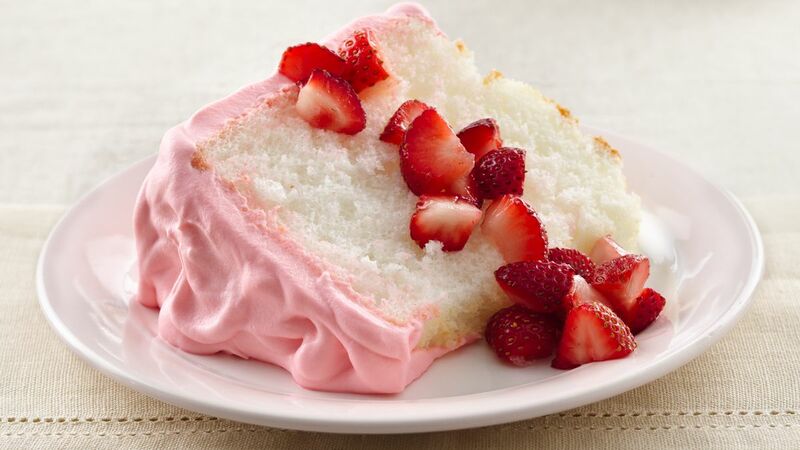 Frost top and sides of cake with strawberry cream mixture. Refrigerate for at least 30 minutes before serving. In small bowl, mix strawberries and sugar; refrigerate until serving. Spoon about 1/4 cup chopped strawberry mixture over each serving. Store covered in refrigerator. The strawberry glaze can be found in the produce section of the supermarket.